Middletown, Ohio, February 21th, 2017 – NuWaves Engineering, an international Radio Frequency (RF) and Microwave solutions provider, announces their broadband low noise amplifier covering C- to X-Band frequencies, extending the frequency range and potential applications over which the HILNA™ family of low noise amplifier (LNA) products can operate. 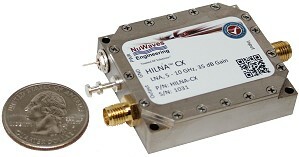 The HILNA™ CX is the latest addition to the NuWaves' High Intercept Low Noise Amplifiers (HILNA™) family of LNA's, covering C- to X-Band frequencies. This model features a miniature form factor of 1.2 cubic inches, allowing for ease of integration into space-constrained systems. The HILNA™ CX delivers over 35 dB of gain across the entire broad range of 5 GHz to 10 GHz with a noise figure of 2.5 dB and OIP3 of +21 dBm. The HILNA™ CX's ultra-broadband coverage allows the user comprehensive spectrum coverage within a single, miniature module. Custom solutions for this LNA module are available for systems requiring other bandwidths, military screening, form factors, filtering, and gain. "As an add-on to an existing communications system, the HILNA™ CX offers the systems integrator the ability to amplify C- and X-Band signals with high linearity for higher resolution imagery and high-resolution imaging radars for target identification and discrimination." said Jeff Wells, President and CEO of NuWaves Engineering. "NuWaves Engineering takes pride in offering first-rate communications solutions to the Warfighter. Our low noise power amplifiers enable greater standoff distances for unmanned aircraft systems (UAS) and unmanned ground vehicle (UGV) applications, giving our armed forces the advantage in hostile environments." NuWaves Engineering is a veteran-owned, premier supplier of RF and Microwave solutions for Department of Defense (DoD), government, and industrial customers. An RF engineering powerhouse, NuWaves offers a broad range of design and engineering services related to the development and sustainment of key communications, telemetry and electronic warfare systems, as well as a complete line of commercially available RF products. NuWaves' products include wideband frequency converters, high-efficiency and miniature solid state power amplifiers and bidirectional amplifiers, high intercept low noise amplifiers and miniature RF filters. NuWaves Engineering...Trusted RF Solutions™.